Rovio continues to find new partners for its Angry Birds brand. The birds from the mobile game have appeared numerous places since the game become popular. There have been partnerships with Lucasfilm, Transformers and even NASA. The latest partnership is with TCBY. 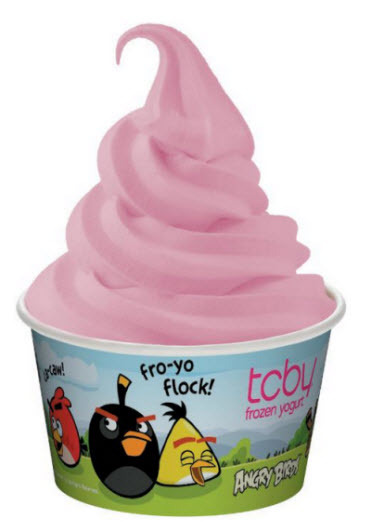 TCBY is launching yogurt and sorbet flavors inspired by the Angry Birds characters. The flavors are available during staggered periods this summer. The first flavor, Red's Birdberry Yogurt, arrives on July 17 and will be available through July 30th. TCBY says the flavor pays homage to "cereal-infused milk." The tart Piggies' Sour Apple Sourbet will make TCBY customers pucker from July 13 to August. A tropical and banana flavor, Chuck's Bananabird Sorbet, will be available from August to August 27. The fourth flavor, The Blues' Cacaw Cotton Candy Yogurt, is State Fair inspired and available from August 28 to September 10th. There have been several versions of Angry Birds games over the years since the original mobile hit, including Rio, Space, Star Wars and Go! The most recent is the pirate themed Angry Birds Epic. The new games and partnerships help keep the Angry Birds franchise alive.